This was a hard fought battle. The Dodgers came screaming out of the gate by scoring 4 big runs in the 1st inning on a 2 run double by Loney and a 2 run homerun by Russell Martin. 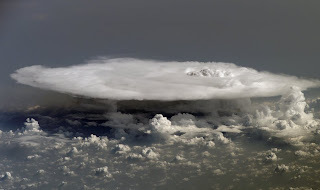 Unfortunately, an initially hittable Paul Byrd righted his ship. Byrd finished the game by pitching 7 strong innings. For the remainder of the game the Dodgers would scatter just 5 more hits and would score no more runs. They could only get a man to thirdbase twice the last 7 times up to bat. With Chad Billingsley on the mound the whole stadium was hoping that he could hold on. Would the abusive Summer heat drain all of his energy? Can the Dodgers pull this out? His curve ball wasn't sharp so the Indians batters starting sitting on the fastball. Chad gave up 8 hits. He lasted only 5 innings, but would give up only 3 runs. Can the one run lead hold up? The relief corps had to bear down. Averting a sweep was a must and we all knew they would be the key. They battled and clawed through the suppressive heat to pitch 4 scoreless innings. Kou, Beimel, Broxton and Saito closed the doors. Only one hit was given up between the 4 of them. They showed us what this team can accomplish. If only the team can show a little bit of consistency. Nevertheless, this was a well earned victory. Dodgers 4, Indians 3. In these lazy heat-filled days of summer it makes more sense to just watch the games on the TV. A Pack A Day pulls a great Steve Sax vintage pin. I have a couple of these pins in my collection and always assumed they were sold at the stadium as a countertop point-of-sale items. Instead, I find that they came in packs. Color me surprised. The 29th Annual Sports Card Collectors Convention is coming up ina month (July 30-Aug 3) in Chicago. If anyone who reads this blog is attending please pass along some pics. I'd love to put them up. I won't be there so I'll be unable to check out some of the rare and unusual collectibles that always seems to show up. Say hello to a new Dodger blog Dodgers Digest. As I always say, "the more the merrier." What a great find. 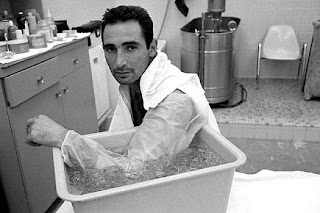 Trolley Dodger shares a great Koufax photo from one of his favorite photoblogs. From the best titled blog I've ever heard"If Charlie Parker Was a Gunslinger, There'd Be A Whole Lot of Dead Copycats." You must check out Variety's special issue featuring the Dodgers and its 50th Anniversary in Los Angeles. Click Here. 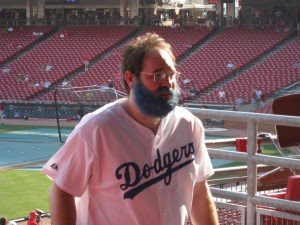 Our favorite video blogger, Troy From West Virginia, was arrested during the Dodger road game in Cincinnati. Diamond Leung has all the news. Troy responds on YouTube about the incident in 4 parts. Click here for Part 1, Part 2, Part 3, Part 4. Mark of LADodgerTalk recalls seeing Troy last year and has photos to prove it. True Blue LA sounds off against the irrationally stupid Philly faithful in defense of JD Drew. Mario and Tatiana go video by starting "The Baseball Card Show." This married duo is become the leaders and head innovators within the collector blog community. Check out their video here. 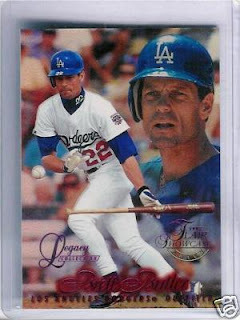 In other news Mario finds an eBay auction for a rare "1 of 1" card featuring Dodgers fan favorite Brett Butler. It sold for an unbelievable $263.88. The August Chronicle ask its readers to tell us about their favorite Baseball card and gets a big response. Unsurprisingly, childhood memories surround many of the stories. I was just a kid and baseball was the only thing on my mind. John Smoltz came to the Kroger on Washington Road to sign baseball memorabilia. I waited in what seemed an eternal line of eager kids and parents. Finally, my turn came and I was standing in front of my favorite pitcher, overwhelmed with excitement. I handed Mr. Smoltz the card, and as he signed it I was overwhelmed with the urge to talk baseball with him, to tell him how dedicated I was to the sport, and that I never missed one of his games. But with the long, impatient line still trailing off behind me, all I could do was ask him for a handshake. Without hesitation, he extended his famous right hand. I'll never forget that firm handshake with the hand that won so many division titles and took the Braves to numerous World Series. Yet, this time the humble man held his hand out to me, a no-name Little Leaguer from Augusta, and I will never forget it.